Are you starting your own business or taking your side hustle to full time status? Congratulations! These are exciting times for you and your business, filled with big ideas and high hopes. At the same time, there are common pitfalls many small business owners make when starting out. These are things that stunt their business growth and discourage them. I’ve been there myself, and while I can’t change the past, I’m happy to share my advice with you to prevent you from making the same mistakes I did. 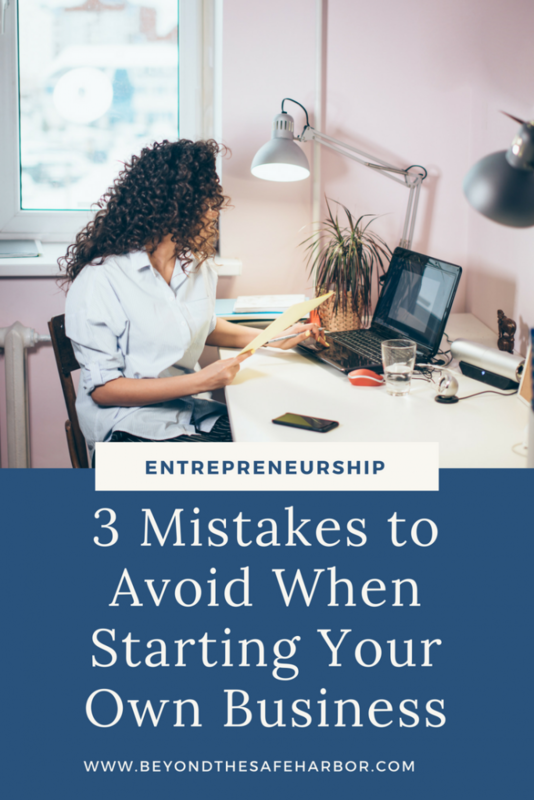 Here are three mistakes to avoid when starting your own business. #1. Trying to do too much at once. When I made the transition from side hustle to full-time gig, I wanted to do ALL the things. I had a list of strategies to test with my Etsy shop, eBooks to publish, an eBook to write, and a blog to relaunch. And a few months in, I added to that a wedding to plan and a move to coordinate. There were a LOT of things to juggle, and my goal was to get everything done at once. I was spreading myself too thin, which led to a few problems. First, I was focused on too many different things that I wasn’t making significant headway on anything. Second, I was switching between tasks and projects too often that I was losing momentum and wasn’t able to get focused on any one thing for long enough to make progress. And third, I felt overwhelmed and exhausted. Instead, I would recommend planning out your next 12 weeks. What are the 1-5 key priorities you need to tackle in this time frame? Then, work deliberately to achieve your top priorities each week. It will lead to more productive work, greater output, and will preserve your sanity. For more tips on planning and productivity, check out my post 5 Ways to Increase Productivity (Free Workbook Inside!). You can also download my FREE Supercharge Your Productivity Workbook when you sign up below. Find it in my Resource Library in the Planning and Productivity section. #2. Being too hard on yourself. When you’re starting out, you probably have big dreams and high expectations for your results. You know what you want your business to be and what type of life it will unlock for you. While these are great things, they can also cause you to place a lot of pressure on yourself. If you don’t work enough hours, get the results you want the first time around, or struggle with unforeseen challenges, it can feel easy to get frustrated with yourself and lose confidence. And when you’re a new entrepreneur, confidence is one thing you really need in order to be successful. So how do you ease up and give yourself more freedom? As I talk about in my post How to Stop Being Hard on Yourself: 3 Powerful Ways, there are several things you can do to turn this around. “You have permission to fail”. Or “You have permission to not work 14 hours a day”. This is powerful for a few reasons. First, it encourages you to be deliberately vulnerable. Since you’re acting as the authority and preemptively giving yourself permission, you’ll be more likely to stay true to yourself. And second, because you’ve given yourself permission to act or feel a certain way, you’re less likely to be hard on yourself about it if and when it happens. By doing this work ahead of time, you’re setting yourself up for greater self compassion and empathy. Thinking this way brings us even lower, as we turn one negative thing into a story of multi-yearlong failure. And the thing is, it’s not true. Was there at least one time in your life you didn’t say the wrong thing at the wrong time? Have you ever gotten things right? Did you ever meet or exceed someone’s expectations? Have you ever experienced success? Chances are, a few salient experiences are turning into “always” and “never”. And that’s simply inaccurate and not fair to yourself. So challenge those absolutes, and ease up. Often when we’re being hard on ourselves, we are caught up in a negative spiral that is externally focused. We’re busy thinking about what we did, what we said, and how we acted. We’re concerned about what people thought, how they perceived us, and what that means. It’s almost like our brains are on a hamster wheel, constantly processing the past and worrying about the future. At times like these, we seem to lose sight of ourselves. We’re so externally focused, that we’re not taking care of number one. Tools like meditation and journaling can bring us back to ourselves and are incredibly powerful. Read the full blog post for more ideas. Looking for more ways to build your confidence? Grab the first chapter of my book, The Confidence Toolkit, FREE, when you sign up below. Find it in my Resource Library in the Personal Growth and Development section. #3. Setting the wrong types of goals. Even if you’re not working with a detailed business plan, chances are you’ve set goals for yourself and your business. Whether it be hitting a certain revenue figure or retiring by a certain age, there are likely key measures you have in mind that equate to success. While having a future focus and setting goals is always a good thing, there’s a right and a wrong way to do it. And if you’re like me, you may be setting goals that are almost perfect, but that are missing one critical component. Check out my post How to Write Goals You Can Actually Achieve for a step-by-step guide on how to set achievable goals. Did any of those pitfalls resonate with you? And what steps do you plan to take to ensure your success? I’d love to hear in the comments. And if you’re a small business owner yourself, let us know what mistakes you stumbled on and how you overcame them.